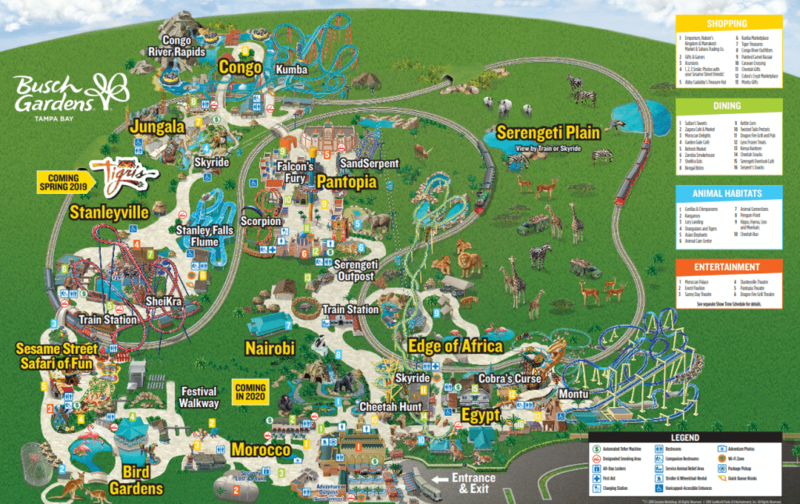 Trying to decide which Busch Gardens theme park would be best for your big class trip? Maybe you just aren't too sure which provides more bang for your buck for your next family vacation? Or maybe you just want to know the similarities and differences between the two franchise parks from Anheuser Busch? Well perfect, because our blog will help you with all of these things! The Busch Gardens theme parks feature world-class thrilling roller coasters, educational animal experiences, stunning natural beauty, and tons of family fun. There is a Busch Gardens park in Williamsburg, Virginia, as well as Tampa Bay, Florida. This blog will provide you with all the info you need on both of the parks coaster, theme, animal, setting, food, and price-wise, and how they may differ in each category! At Busch Gardens Williamsburg you will find some of the very best thrill coasters in the United States, from the 6-inversion Alpengeist to the 210-foot drop Apollo's Chariot. In 2019 the park is looking to add to its army of action-packed coasters with Finnegan's Flyer, an 80-foot swing ride that will top out at 45 mph. In addition to the fun coasters and thrill rides, Busch Gardens Williamsburg also offers waterpark fun with Water Country USA. Here your group can enjoy the Mega Slide, Lazy River, and in 2019 the new thrilling Cutback Water Coaster! Busch Gardens Tampa certainly doesn't disappoint when it comes to world-class coasters either! Known as Florida's Roller Coaster capital, Busch Gardens Tampa offers the 335 drop tower, Falcon's Fury, the triple launch Cheetah Hunt coaster, fan favorite Sheikra, the 200-foot floorless coaster, and many more such as well known Kumba and Mantu. In 2019 a new exciting addition will be made, a 150-foot surge, inverted roll, and forward and backward launch coaster called Tigris. Both parks share a similarly themed kids fun zone, Williamsburg hosting the Sesame Street Forest of Fun and Tampa the Sesame Street Safari of Fun. The themes of these two parks are very different and very detailed, both providing an impressive aesthetic that transports you to another world. In the case of Busch Gardens Williamsburg, this world is Europe! Here you will find lands such as New France, France, Italy, Ireland, Germany, England, Scotland, and Oktoberfest. Our theme is classic Europe with artfully landscaped villages, like the Parisian streets of France, the hamlets of Scotland and the Oktoberfest celebrations of Germany. In all, we have nine villages centered around six countries for you to explore. At Busch Gardens Tampa your group will encounter an African theme, with worlds like Edge of Africa, Pantopia, Congo, Morocco, Jungala, Egypt, Nairobi, and Stanleyville. 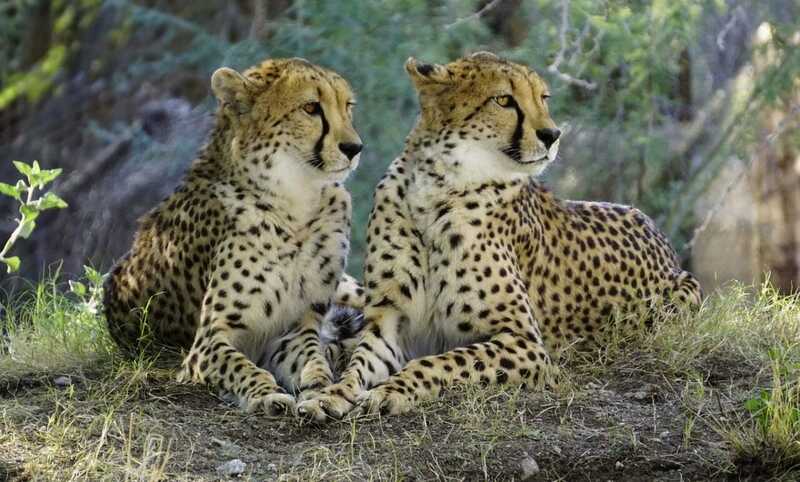 While both Busch Gardens provide animal experiences and feature animals onsite, Tampa definitely takes the cake for amazing animal experiences, bringing the African Serengeti right to you with their in-depth theme! As mentioned above, you can expect to encounter outstanding animal experiences at both Busch Gardens parks, though the selection of animals found at each and amount of experiences and observation opportunities highly vary. 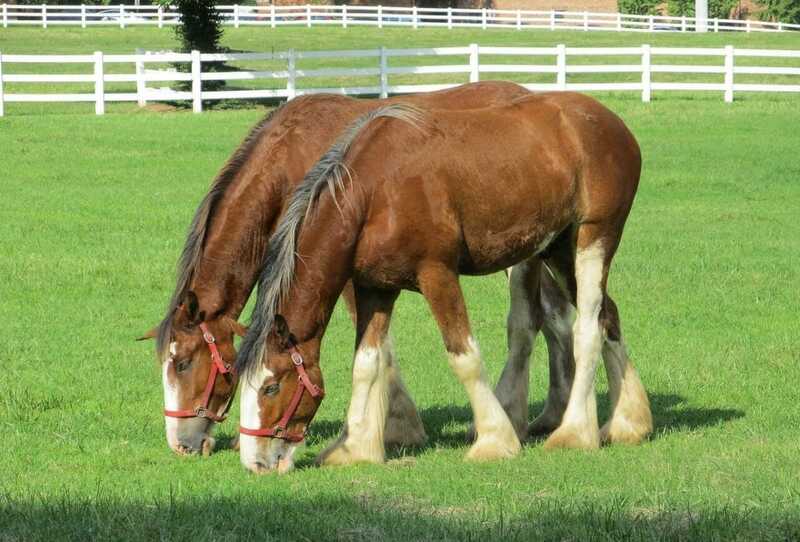 In Busch Gardens Williamsburg you will find the Highland Stables featuring gorgeous Clydesdales, as well as Eagle Ridge, Lorikeet Glen, and Wolf Haven. The focus here is on common European animals. You can visit these different animal areas and participate in any shows, learning experiences, or simple observation. Busch Gardens Tampa is a bit of a different story, this park focusing much more on their animal aspect than anything else. Explore one of the largest, most highly accredited zoo facilities in the US. From some of the world’s most interesting animals to some of its most endangered, share in our passion for the animals in our care through up-close encounters and our state-of-the-art Animal Care Center, as seen on the hit TV series The Wildlife Docs. Here you will find over 12,000 animals representing over 300 different species, including giraffes, elephants, monkeys, rhinos, and a myriad of big cats like cheetahs, tigers, and lions. This park is almost more zoo than theme park! Both dining and shopping options are similar in the variety and the total number of opportunities at each site, but as with everything else in the parks, they differ greatly in their themes. In Williamsburg, you will have European centric options such as German Pretzels and Beer, Brauhaus Craft Bier, Dast Fest Haus, Trapper's Smokehouse, Squire's Grille, Les Frites, O'Taters, and Marco Polo's. The park is actually well-known for their worldly culinary delights! In Tampa find the Serengeti Overlook, Dragon Fire Grill and Pub, Zambia Smokehouse, Zagora Cafe, Serengeti Overlook Pub, Garden Gate Cafe, and Bengal Bistro. There are fun souvenir shops at each park similarly themed as well. 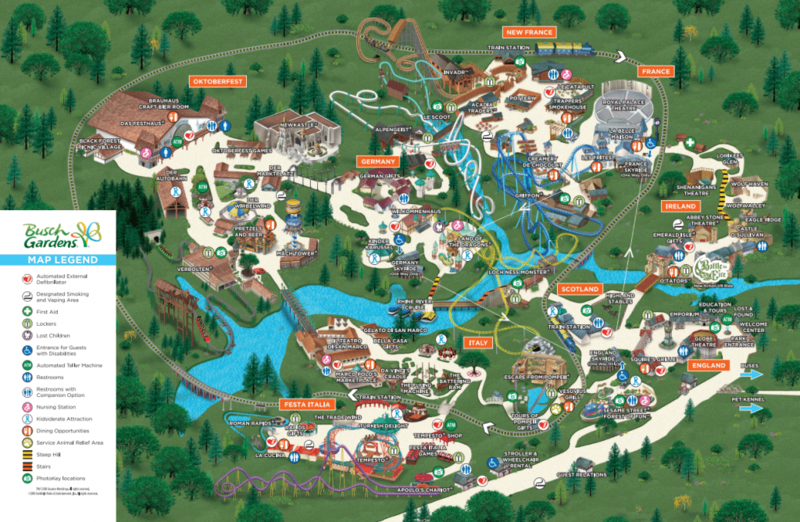 The easiest way to understand the setting and layout of each park is by checking out their downloadable maps (click the photos below). While the parks have a similar setup, the cities they call home are very different setting-wise. Busch Gardens Williamsburg sits on the banks of James River within the confines of the historic triangle of Colonial Williamsburg, Yorktown, and Jamestown. This makes the setting a bit more historic and educational than Tampa, yet it is only one hour from Virginia Beach for oceanside fun! Busch Gardens Tampa sits near Tampa Bay and Orlando in Florida, providing seemingly endless options for family-friendly fun and beachside bliss! 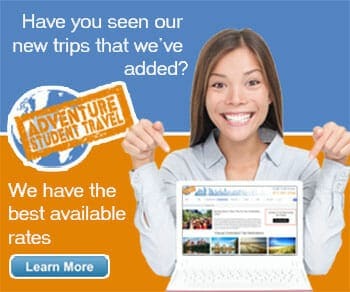 Learn more about Busch Gardens Tampa and Busch Gardens Williamsburg. Check out more in-depth info on the new rides coming to each park in 2019 with our 10 New Rides Coming to Theme Parks in 2019 blog.